I suppose the NuLabour party has to get its priorities right. Banks are more fun than post offices aren't they? Now everytime the Labour Government repossess someone's house will that get nationalised too and given to the nearest local authority as a council house? I just heard a figure on the telly that astonished me, I know figures are being bandied about like snowflakes in a blizzard but someone suggested that the taxpayer is into this for 100 billion pounds. 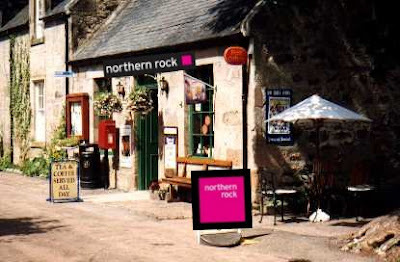 Doesn't that kind of money give us a chance for a little compromise over the Nairnshire post offices? Apologies if you have seen these pics before. 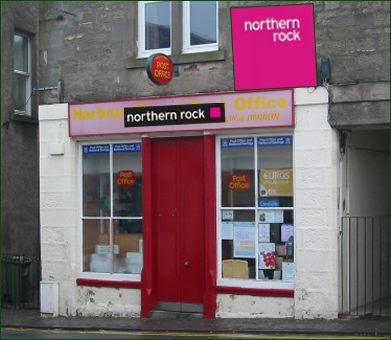 how many have marched so far to save a branch of the Northern Rock? None methinks but we equalled the queue! What next? The Bradford, Brown Bingley and Branson?